Lapis Lazuli is a well-maintained 1987 66' DeFever offering a 4 stateroom - 4 head layout, pilothouse on the same level as the salon and galley, internal stairs to the flybridge, fuel efficient CAT main engines, 3200 fuel capacity for long range cruising, stabilizers, bowthruster, and numerous updates. This selling couple and their child have lived aboard and cruised by themselves easily and comfortably, but now they are ready for a new adventure, so Lapis Lazuli is duty paid and offered for sale. Price reduced!Post Hurricane Irma condition update: Lapis Lazuli did sustain some damage to the flybridge enclosure from the winds of Hurricane Irma, but is available for inspection anytime. 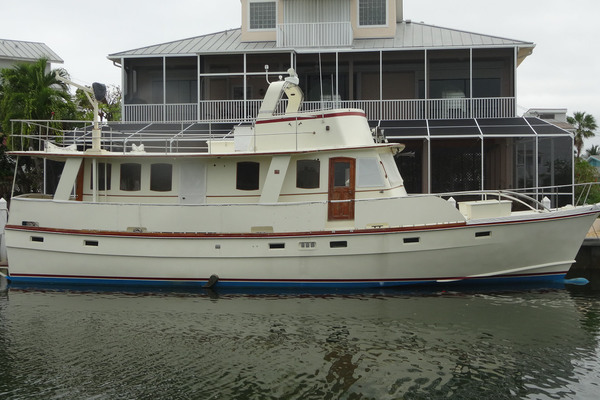 United Yacht Sales New Jersey would love to guide you through a personal showing of this 66' Defever Motoryacht 1987. 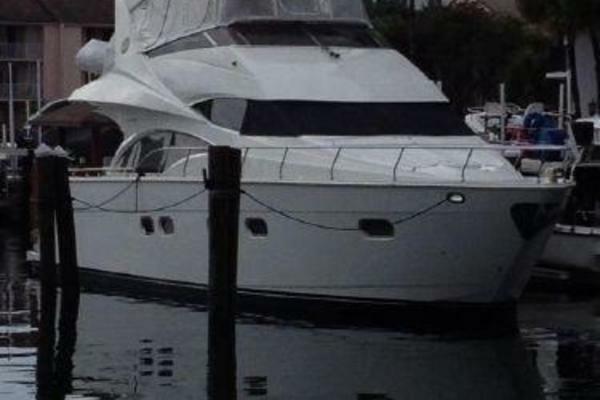 This yacht for sale is located in Jacksonville, Florida and priced at $300,000. For a showing please contact us by filling out the form on this page and we will get back to you shortly! Entering the salon from the covered aftdeck, you will find the stairs to the master stateroom and engine room starboard aft, L-shaped seating and ottoman/coffee table port aft, galley with bar and bar stools port forward, cabinetry with flat screen TV on a lift to starboard and a wetbar starboard forward. Continue forward into the pilothouse and you will find internal stairs to the flybridge starboard aft, wing doors on each side and then stairs starboard forward to the guest staterooms. There are three guest staterooms forward. Lapis Lazuli offers a full beam master stateroom aft with a centerline king size berth and ensuite head, a guest stateroom port forward with a queen size berth and ensuite head, a guest stateroom starboard forward with offset double size berths and a head and enclosed shower in the companionway and the final guest stateroom all the way forward with over/under bunks and an ensuite head. 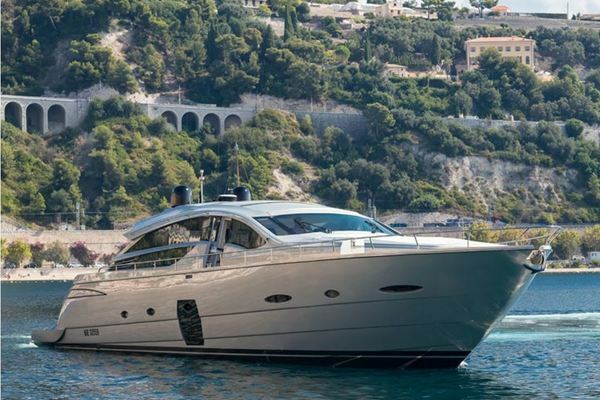 The huge salon on Lapis Lazuli offers L-shaped seating with ottoman/coffee table to port, galley bar port forward, wetbar and storage cabinetry starboard forward, cabinetry with flat screen TV on a lift to starboard and the stairs to the master stateroom and engine room starboard aft. There are large side windows with wood blinds, double teak & glass doors with a curtain aft, Phantom roll-away screen door aft and new Hickory wood sole. Dining space is available at the galley bar, the pilot house table, and the flybridge table. The full beam master stateroom aft offers a centerline king size berth, nightstands, reading lights, 6 portlights, hanging lockers, storage cabinets and drawers, new Hickory wood sole and ensuite head with enclosed tub/shower with new sliding door. The port guest stateroom offers a queen size berth, nightstand, 2 portlights, shelf, hanging locker, storage cabinet and drawers, Toshiba TV/DVD, DirecTV satellite TV receiver, new vinyl wood sole and an ensuite head with enclosed shower with new door. The starboard guest stateroom offers offset double size berths, 2 portlights, reading lights, storage drawers and cabinets, hanging locker, new vinyl wood sole and Toshiba TV/DVD. The head with enclosed shower and new door is to starboard in the guest companionway. The forward guest stateroom offers over/under bunks, 2 portlights with shades, overhead hatch, reading lights, hanging locker, storage cabinets and drawers, new vinyl wood sole, Toshiba TV/DVD, DirecTV satellite TV receiver and ensuite head with enclosed shower with new door. The pilothouse offers a full helm with storage forward, L-shaped settee and table aft, side deck access doors each side with screens, internal stairs to the flybridge starboard aft, storage cabinet to starboard, stairs starboard forward to the guest staterooms and a teak & holly sole. The flybridge offers a bimini (2018), Radar arch, full helm with storage forward, helmseat, non-skid deck, bench seats both sides, wrap-around seating and table port aft, wetbar in the center, tender storage aft and a hatch with ladder to the aftdeck. The covered aftdeck offers a full Eisneglass enclosure with built-in screens, same level side deck access via wing doors with screens, aft control station, 4 chairs and a teak table, Jenn-air BBQ grill, teak deck, transom door to the stainless steel & teak ladder to the swimplatform, ladder and hatch to the flybridge, lazarrette access and double teak & glass doors to the salon.